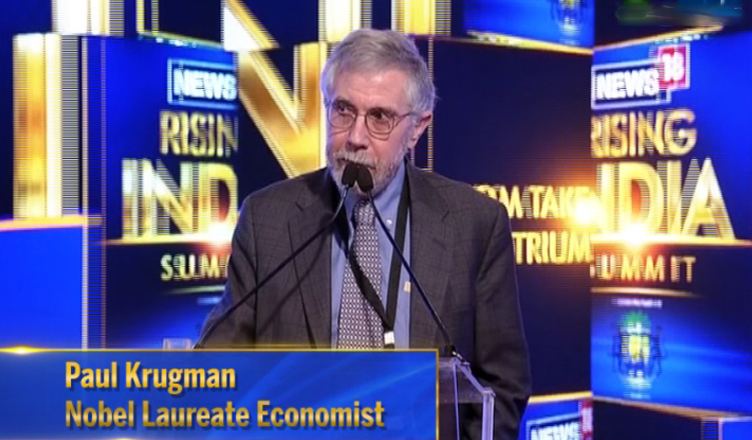 2008 Nobel Prize winner, American economist Paul Krugman has warned that India could end up with huge mass unemployment if it fails to grow its manufacturing sector. “There is this concept called artificial intelligence that you should be wary of. In future, while diagnosis may be outsourced to a doctor in India, it could also go to a firm based on artificial intelligence. Things like this could be a cause for worry for Indian services sector,” Economic Times quoted Krugman as saying while speaking at a News 18 event. “Japan is no longer a superpower because its working-age population declined, and China is looking the same. In Asia, India could take the lead but only if it also develops its manufacturing sector, not only the services one. India’s lack in the manufacturing sector could work against it, as it doesn’t have the jobs essential to sustain the projected growth in demography. You have to find jobs for people,” he said further. While appreciating India’s growth story, Krugman said that it never got the attention it should have as China hogged all the limelight. “Rest of the world is not paying as much attention to India as it should. If China wasn’t around, we would have said what an incredible story India is. Quadrupling of GDP per capita in a very short time, becoming a better place to do business etc,” he said. “Prime Minister Modi talked about bringing electricity to parts of India that have never seen it. When such a plan is fulfilled you obviously will see a huge boost to your economy,” Krugman said while emphasising on the fact that there were still huge parts of India that had yet to realise their full potential.